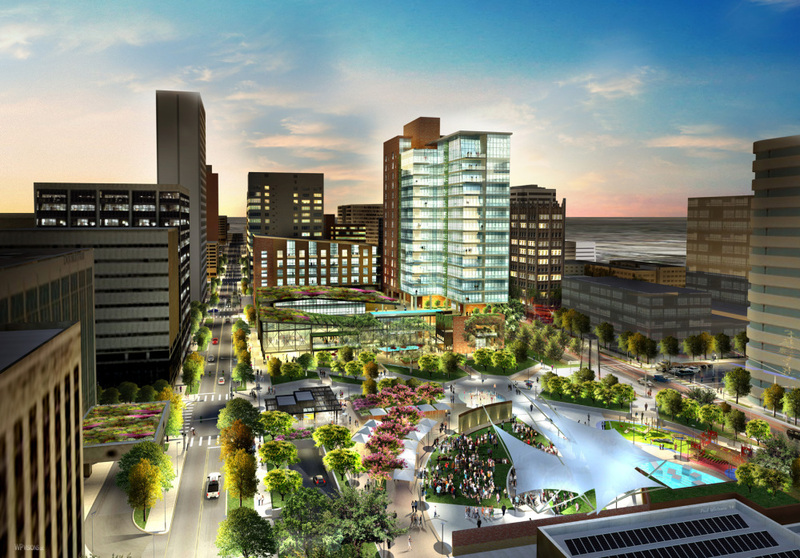 Across the country, there’s a trend toward downtown revitalization and urban living. Midland is no exception. A large group of young professionals working in the oil and gas industry desire an urban lifestyle, and the new $100 million Santa Rita Hotel in downtown Midland is being created in part to meet that interest. This 17-floor boutique hotel will offer residential, retail, and office space. The mixed-use development also includes around $20 million in public improvements, like the redevelopment of nearby Centennial Plaza and construction of an underground parking garage with 467 spaces. Jump over to MidlandDirt.com to read the rest of this story! Today, we bring you the inaugural column in a new ongoing series, Interview with an Architect. The goal is to speak with leading voices in the North Texas architecture community and learn about their work, development issues in our community, and good design practices and principals. Evan Beattie, AIA, LEED AP, is a Principal with Good Fulton & Farrell, Inc., an award-winning multi-disciplinary design firm based in Dallas. 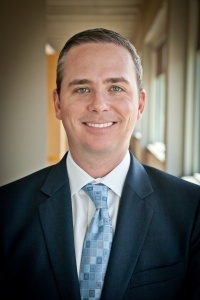 He’s been with them for 10 years, and was named one of Dallas Business Journal’s 40 Under 40 in 2013, as well as one of the “Top 20 Under 40 in Architecture, Engineering and Construction” by ENR Texas & Louisiana in 2011. He earned his Bachelor’s of Architecture from the University of Texas at Austin and moved to Dallas in 2003. He currently lives in the Henderson Avenue area, where he organized fellow residents into the Henderson Neighborhood Association in 2009 to help them have a voice in the development of that fast-growing area. Beattie and his wife will move this summer to a new house he designed in the Urban Reserve neighborhood of sustainable modern homes just a few exits north on Central Expressway. His work with Good Fulton & Farrell has included the Alta Henderson Apartments in Dallas; master planning for The Canyon in Oak Cliff in Dallas; and Fiori on Vitruvian Park in Addison. He is currently working on three projects adjacent to the Henderson Avenue area, two of which will be mixed-use developments in that neighborhood. “It has been amazing to watch the pace of change in the urban core of our city these last 12 years, and the momentum just keeps growing for additional investment in urban revitalization and the creation of great public spaces and parks that make our city more livable,” Beattie said. Jump to read our interview! Another residential development is underway near West Dallas’ super hot Trinity Groves neighborhood with the construction of Alta Yorktown by Wood Partners LLC. 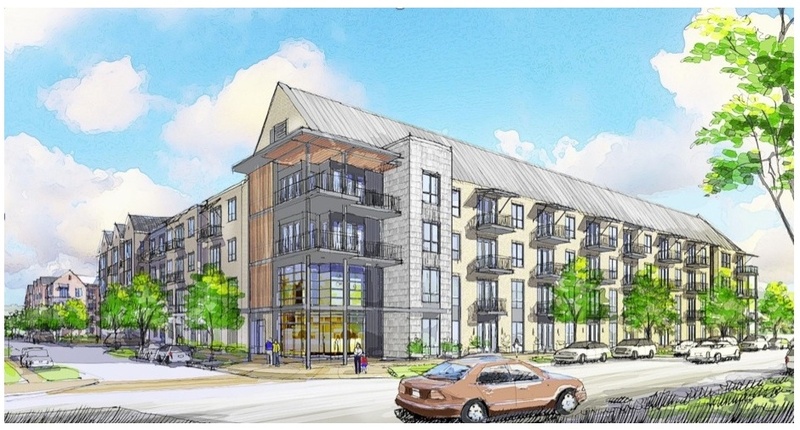 The development will include 226 luxury apartments in three, four-story buildings on six acres. The property, located at 660 Yorktown St., is just one mile west of downtown Dallas, and sits near the Trinity Groves restaurant, retail, and entertainment area. Rents at Alta Yorktown will average just over $1,300 a month for apartment homes that average 827 square feet (available as studio, one, two, and three bedrooms). 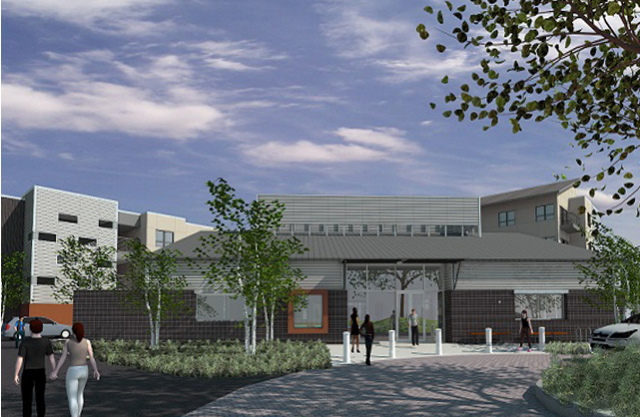 Leasing will begin toward the end of 2015, and construction is slated for completion toward the middle of 2016. Interior finishes in the apartments will include granite countertops, stainless steel appliances, tile backsplashes, Shaker wood cabinets, upgraded fixtures, and wireless technology packages. Community amenities will include an outdoor swimming pool and courtyard, grilling stations, and fire pits. The property will also have a small amount of retail space. Alta Yorktown is just one of multiple new developments in and around Trinity Groves, where Wood Partners has a big stake in the neighborhood. It sits next to the Sylvan Thirty mixed-use project, in where Wood Partners built the 200 apartments, and the Alta West Commerce apartments, which will have 252 units. Jump to read more! 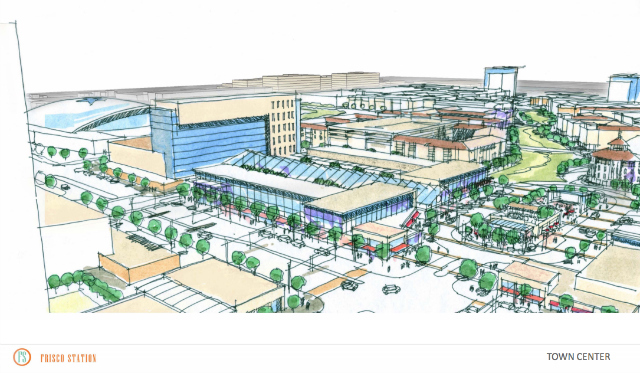 An artist rendering of the Town Center of Frisco Station. Photo courtesy of city of Frisco. More big news for Frisco as the Rudman Partnership, Hillwood Properties, and VanTrust Real Estate sign on the dotted line for the development partnership of Frisco Station, a $1.7 billion deal. This 242-acre mixed-use development will be located along the Dallas North Tollway, north of Warren Parkway. It will surround the Star, the headquarters and training facilities for the Dallas Cowboys. 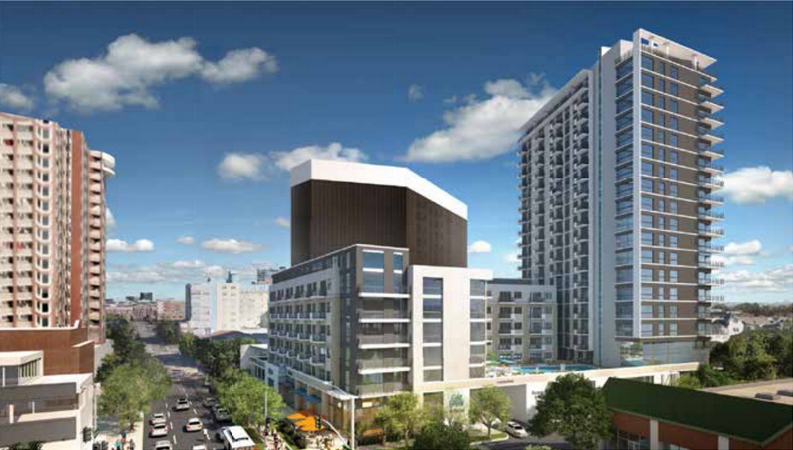 Work will begin on the Trinity Village development in West Dallas in 2015. Rendering courtesy of StreetLights Residential. More good news for development in West Dallas with word Thursday that Dallas-based Stonelake Capital Partners has closed on a 25-acre tract of industrial property on Singleton Boulevard, west of Sylvan Avenue. Along with developer StreetLights Residential, Stonelake is planning a $200 million mixed-use development at 1000 Singleton Boulevard, on the southwest corner of Singleton and Sylvan. Every time I drive by the practically abandoned Valley View Mall, I let out a little sigh. It’s just so ugly! The only thing that attracts a crowd over there is the random carnival. It’s tragic, especially for such a visible area. But Scott Beck, who purchased Valley View last year, has sworn to revive the largest continuous tract north of 635 into a vibrant, bustling center of activity. If you don’t remember Beck, read up Candy’s interview with him here. It’s a good thing that there are plans for the area, which is being called “Midtown” even though it’s not really in the middle of Dallas. I’ll let the semantics surrounding the name slide just for the fact that I am excited about reclaiming that area. The excitement must be catching, because Theresa O’Donnell, City of Dallas Sustainable Development director, is pretty stoked, too. Today’s presentation, which you can view a PDF of below, is just a taste. More details will be available on April 4. 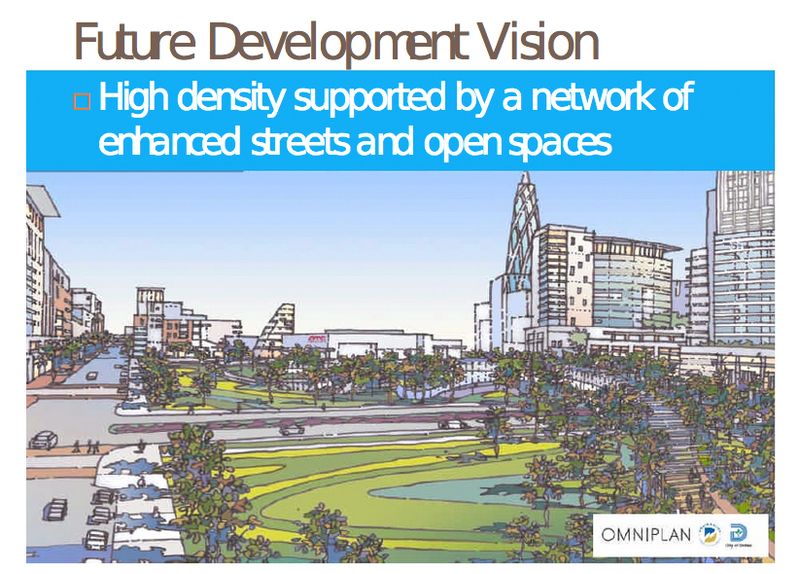 I’m looking forward to finding out more about the development, and how the city is going to foster a dense, pedestrian friendly environment in an area sandwiched by two major traffic thoroughfares — the Dallas North Tollway and 635. Still, anything is better than how Valley View looks today, right?